Schools Chancellor Joel Klein recently broke ground on a brand new mixed-use development that will house two public schools. 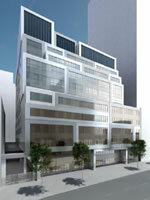 Located at 250 East 57th Street, the $500 million development will house new, modern facilities for P.S. 59 and the High School of Art and Design, which will open to students in September of 2012. Construction of the schools will be paid for by Capalino+Company client the Worldwide Group as part of a partnership with the Department of Education’s Educational Construction Fund (ECF), which develops mixed-use real estate projects featuring new school facilities. The 57th Street complex is the largest ECF project to date. The project kicked off in 2008, with the construction of a 470-seat school at 250 East 63rd Street, which was the first school in the City built to the School Construction Authority’s “green” standards. This facility currently serves as a temporary site for P.S. 59 students while the new P.S. 59 is being built at 57th Street. Once the students, teachers, and administrators move into the new P.S. 59, the school’s current 63rd Street location will provide additional seats for another school. The World-Wide Group was selected by the ECF in a competitive bidding process to develop the 1.5 acre property. The development, which is expected to create 1,100 construction and 500 permanent jobs for the city, will occur in two phases. Phase I includes the construction of the two new schools and 38,000 square feet of retail space to be occupied by Whole Foods. Phase II includes the design and construction of an additional 78,000 square feet of retail space and approximately 350 residential units. The school portion of the mixed-use project will be financed via tax-exempt bonds issued by ECF. In ECF projects, revenues from private developments are pooled to repay school bonds. The World-Wide Group is leasing the 57th Street site from ECF for seventy-five years. Since its creation by the State Legislature in 1967, ECF has constructed 17 projects in New York City that include 19,000 school seats.